Drogon Rechen was born to an educated family in the Yarlung area of Tsang, part of Central Tibet. As a young child, he demonstrated his awakened potential in the gradual path of hinayana-mahayana. At the age of nine, he connected to the Kagyu master, Zangri Repa, and received many teachings, including ear-whispered teachings and dohas of the Mahamudra masters. He practiced meditation wearing only a cotton cloth and was therefore called “Rechen,” which means “great cotton-clad yogi.” He experienced many signs of meditative accomplishment. When he reached the age of fifteen, his teacher, Zangri Repa, passed into parinirvana. Before his passing away, Drogon Rechen was advised to find the disciples of Milarepa’s lineage, receive the full lineage transmission, and practice hard so that he could become a great master in this tradition. In accordance with this, he studied and practiced under many Kagyu masters as well as with Dzogchen masters. Although he attained great qualities of samadhi he still was not fully satisfied. Deciding to leave his home to develop his practice further, he started a journey to Kham, in eastern Tibet, through Kongpo. On his way, he met and received many teachings – from Thöpa Samdrup, he received the complete transmission of the Chöd lineage; from Ngari-pa, he received Vajrapani and Vajrasaddhu; from Nyalpa Josey, he received Peaceful and Wrathful Manjushri and Mahakala. He established eighteen Tantric seats and many great practitioners have been produced as a result. Drogön Rechen mastered the prana and nadhi practices at this point, and a little bit of pride in his accomplishment developed. Upon hearing the fame of the First Karmapa Düsum Khyenpa, who was living at Kampo Nenang, Drogön Rechen decided to meet him. He simply wished to pay Düsum Khyenpa his respects, but had no intention of studying with the Karmapa. The First Karmapa told Drogon Rechen, when they first met, “O young tantric practitioner, you can go and study with my students.” Drogön Rechen asked “what kind of students do you have?” Karmapa replied “Deuchung Sangye, Baltsa Takdelwa, and so on.” Drogon Rechen first went to see Deuchung Sangye who directed him to Baltsa Takdelwa. When he went to the cave of Takdelwa, he saw a huge tiger sleeping there and he ran back with great fear. Deuchung told him to go back again and when he did, he saw a little pond in the cave. He circumambulated the water and threw some pebbles in it and left. When he was told to go back and went, he saw an old yogi who had those pebbles he threw on his lap. At that time, he thought “if the students are like this, it is unnecessary to point out how great must be their teacher’s realization and achievement!” Making a strong commitment, he practiced under their direction for seven years and completely settled his practice and realization. Drogon Rechen became one of the most important heart disciples of the First Karmapa. He was fully ordained as a monastic at the age of thirty-seven and received the name Sönam Drakpa. He received the full Kagyu transmission from the First Karmapa for three more years, and became the lineage-holder. 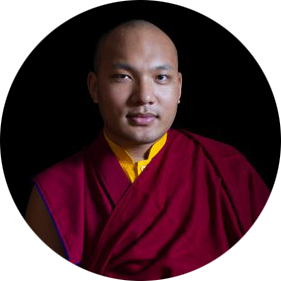 When Karmapa traveled back to Central Tibet, Drogön Rechen stayed behind in the Kham region and continued the activities of the Karmapa and the lineage at the seats of Karma Gön and Kampo Nenang. At the age of 70, he passed into parinirvana on the 25th day and many relics arose from the cremation. His principal disciple and the Kagyu lineage holder was Pomdrakpa Sönam Dorje. These details about Drogon Rechen are compiled from Pawo Tsuklak Trengwa’s Feast For Scholars (chos ‘byung mkhas pa’i dg’a ston), Beijing edition, vol. 2, pp. 873-877. May this be virtuous!